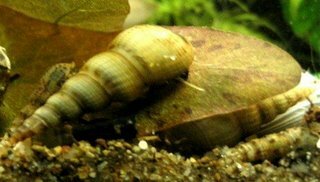 It seems to be confirmed: dosing Maracyn (not Maracyn 2), an antibiotic, to combat Blue-Green Algae in my aquarium has killed off all of my Malaysian Trumpet Snails. I dosed exactly according to the package. I don't know how or why it killed them all, but there are empty shells everywhere and I haven't seen one live snail in weeks. Others I've talked to have said that they've used Maracyn to treat their aquariums and their MTS have been fine, however there was no other change in the aquarium that could have done it. The shrimp were fine so it wasn't nitrites or ammonia and they started acting sick almost immediately after the first dose. Other snails in the aquarium including pond snails and mini-ramshorn snails were unaffected. I'm curious to see if anyone else has treated their aquarium with Maracyn and what effect if any it has had on their MTS. Leave a comment and let me know! I never noticed any affect, but I also do not pay much attention to the snails in my tanks. I will be interested to see if you get any confirmation from others. Great WEB site btw!